The VIVREAL 1500W portable ceramic heater is made for those chilly days in your house or at the office. The compact size provides effective, consistent warmth and won't get in the way. This mini home heater is also suitable for use in a garage, basement, cottage or cabin. This portable space heater has two heat settings, 750W and 1,500W, and also features a cool fan, you can set the control switch to cool fan, low or high position to achieve the desired heat. Turn the thermostat knob anti-clockwise to the temperature required and Turn off by turning it completely clockwise. The limit position the thermostat knob can be turned to work depends on the ambient temperature. Note: When turn the thermostat knob anti-clockwise to the limit position, you will hear "click" sound and the heater will start to blow cool air for safety. This small space heater has a self-regulating element and automatic overheating protection for added safety. The portable space heater will automatically shut it off once it gets too hot and back to work once it gets to a safe temperature inside. The ceramic heater also has a tip-over safety switch, which shuts the heater off if it gets knocked over accidentally to help prevent accidents. 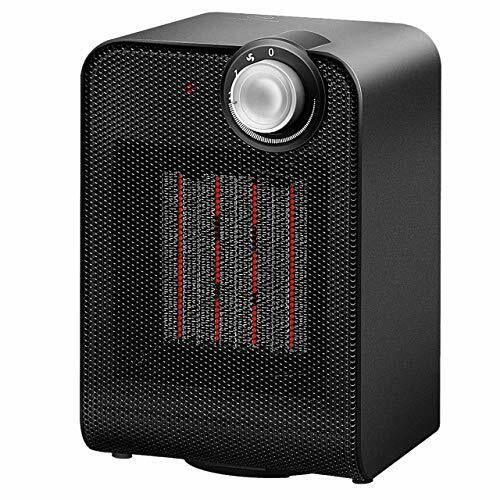 This energy efficient space heater is equipped with 90 degrees widespread oscillation function for reliable heating performance. The office heater also features integrated carry-handles, making it very easy to carry. Besides, this home heater works very quietly and its body can stay cool except the metal mesh during operation. VIVREAL provides 2-YEAR WARRANTY & SATISFACTION GURANTEE for this portable heater. Get convenient warmth with this mini heater!